The remote island of Chirinkotan is in the Northern Kuril Islands at the southern end of the Sea of Okhotsk, about 320 km SW of the tip of Kamchatka, Russia. It is an outlier about 40 km NW of the main Kuril Islands Arc. There have been very few historical observations of activity at Chirinkotan, although there is at least one confirmed 19th century observation of lava flows. A short-lived event that resulted in a small, low-level ash plume-and-gas plume was seen in satellite imagery on 20 July 2004 (Neal et al., 2005). Volcanic activity resumed in mid-2013, with intermittent ash plumes, thermal anomalies, and block lava flows reported through April 2017. The volcano is monitored by the Sakhalin Volcanic Eruption Response Team (SVERT) of the Institute of Marine Geology and Geophysics (Far Eastern Branch, Russian Academy of Science), and aviation alerts are issued by the Tokyo Volcanic Ash Advisory Center (VAAC). A new eruptive phase began with a likely ash emission on 11 June 2013. Intermittent thermal anomalies and gas-and-steam emissions were reported for the next 12 months, sometimes drifting up to 100 km, usually SE. Renewed thermal anomalies and gas emissions were recorded during clear weather beginning on 21 November 2014. Two ash plumes observed in late July 2015 were the likely sources of fresh ashfall and block lava flows sampled during a visit by Russian geoscientists on 9 August 2015. A gas-and-steam plume on 17 November 2015 was the last activity observed, except for low-level thermal anomalies, until a substantial ash plume was captured in satellite data at 8.8 km altitude over a year later on 29 November 2016. Additional ash plumes were observed in satellite data once in late January, and twice each in March and April 2017. Activity during May 2013-June 2014. After no reports of activity since July 2004, SVERT observed gas-and-steam emissions in satellite imagery beginning in late May 2013. They raised the Alert Level from Green to Yellow (on the four level Green-Yellow-Orange-Red scale) sometime between 27 May and 10 June. The first likely ash emission was reported on 11 June, followed by a thermal anomaly detected on 13 June. Thermal anomalies continued to be detected by SVERT during June and July 2013. The first MODVOLC thermal alert was reported on 22 July; they were reported monthly after that through 11 December 2013, with several days of multiple-pixel alerts. SVERT also noted thermal anomalies and gas-and-steam emissions during August through December, including plumes drifting 30-60 km SE during 17-19 October, 55-100 km SE during 5-6 November, and more than 50 km SE on 25 November. From the beginning of January 2014 through early June, persistent thermal anomalies were observed in clear imagery nearly every week by SVERT, along with intermittent steam-and-gas emissions. Several times during March, plumes were observed drifting 80-170 km SE. MODVOLC thermal alerts were reported on 8 February, 4 days in March (four pixels on 8 March), and twice on 27 May. SVERT reported that beginning on 24 May, gas emissions containing ash were detected in satellite images. A decrease in thermal anomalies observed by SVERT led them to lower the Alert Level to Green on 5 June 2014. Activity during November 2014-July 2015. SVERT raised the Alert Level back to Yellow in late November 2014, citing new thermal anomalies beginning on 21 November followed by intermittent steam-and-gas emissions. A plume was observed drifting 40 km SE on 27 November. A new MODVOLC thermal alert appeared on 4 December. SVERT reported thermal anomalies and diffuse gas-and-steam plumes during December 2014 and January-February 2015. Emissions were detected 3 km above Chirinkotan drifting SE on 5 January 2015. MODVOLC reported two thermal alert pixels on 7 January and one on 10 January. SVERT briefly lowered the Alert Level to Green between 4 and 20 March when no activity was detected. Thermal anomalies were reported again beginning on 19 March; they were noted weekly along with intermittent gas-and-steam emissions through mid-May when the Alert Level was lowered back to Green again on 19 May. MODVOLC reported a three-pixel thermal alert on 20 July 2015 (local time). The Tokyo VAAC reported an eruption on 21 July (local time) with an ash plume rising to 3.7 km altitude drifting SE. The plume was observed in satellite imagery for about 2 hours before dissipating. SVERT reported a thermal anomaly and steam-and-gas emissions on 22 July, and the Alert Level was raised to Yellow. Another ash plume was reported by the Tokyo VAAC on 26 July rising to an altitude of 4.6 km and drifting NW for several hours before dissipating. Expedition during August 2015. Scientists from the Institute of Marine Geology and Geophysics (IMGiG) of the Far Eastern Branch of the Russian Academy of Sciences visited Chirinkotan on 9 August 2015. While there, they observed steaming from a recent blocky lava flow near the coast (figure 3), hiked to the summit, and collected data about volcanic and biological activity on the island. 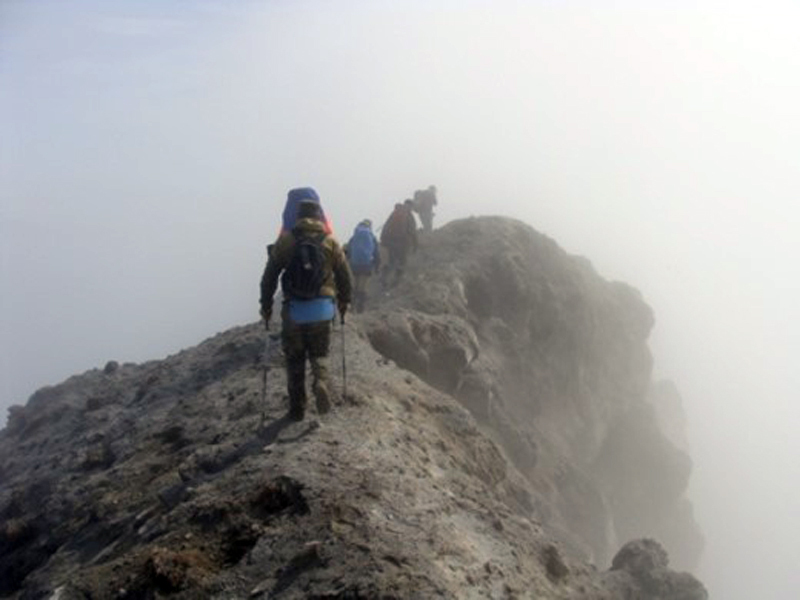 A group of researchers climbed to the edge of the summit crater at 600 m elevation, where clouds prevented clear views of the crater (figure 4), however the strong odor of sulfur and noise from fumarolic activity was noted. The scientists sampled the fresh pyroclastic rocks. When the visibility improved, the depth of the crater was observed to be about 150 m; an extrusive dome in the center had a vent on the top emitting gas. Figure 3. Steam rising from recent lava flow at Chirinkotan that reached the coastline, 9 August 2015. Courtesy of IMGiG (Diary of the Kurils 2015 Expedition, 7-9 August 2015, http://imgg.ru/ru/news/111 ). Figure 4. 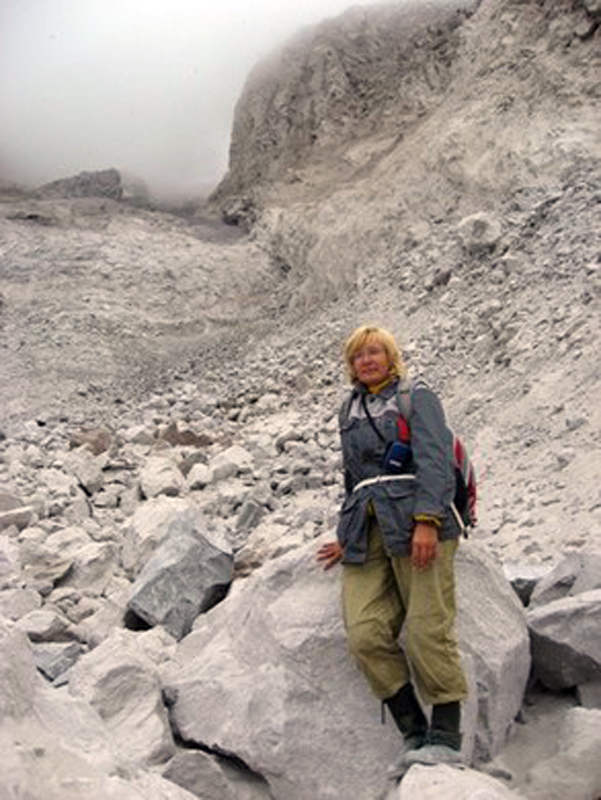 Fieldwork at the summit crater rim of Chirinkotan, 9 August 2015. Courtesy of IMGiG. (Diary of the Kurils 2015 Expedition, 7-9 August 2015, http://imgg.ru/ru/news/111 ). The upper flank of the volcano was strewn with ash and bombs (from 2-3 cm to several meters in diameter). 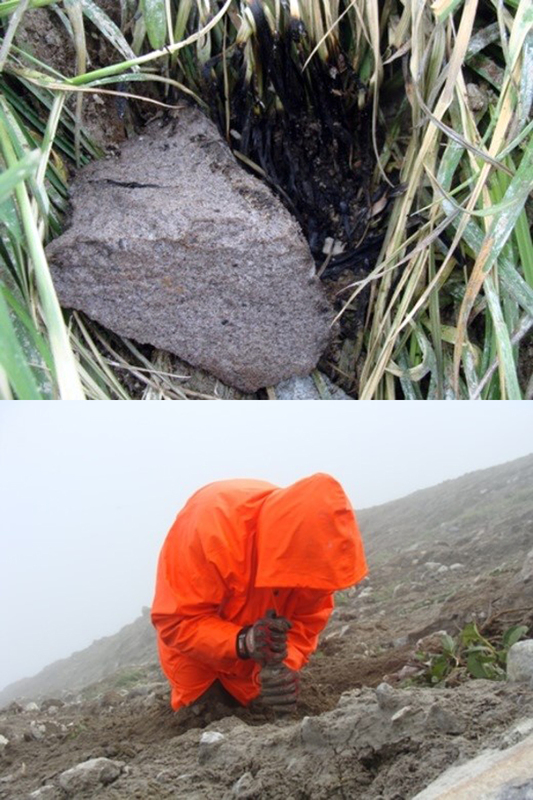 Scientists observed recently buried and charred living vegetation, and nesting birds freshly killed by volcanic ash and bombs, indicating a very recent event (figure 5). The botanists in the research group noted that all of the vegetation on the upper and middle flanks had been killed 2-3 years ago in a major event, likely during the start of the 2013 eruptive cycle. Ash deposits ranged in thickness from a few centimeters near the coast to 8-15 cm near the summit. During a survey of a pyroclastic flow on the SW coast, scientists noted that it was still hot on the surface (40-60°?) and consisted of block lava, bombs, and volcanic ash (figure 6). Figure 5. Evidence of recent explosive activity at Chirinkotan. Top: recently burned vegetation from a volcanic bomb on the flank. Bottom: living vegetation buried in recent volcanic ash, 9 August 2015. Courtesy of IMGiG (Diary of the Kurils 2015 Expedition, 7-9 August 2015, http://imgg.ru/ru/news/111 ). Figure 6. Still-hot debris from a block lava flow on Chirinkotan, 9 August 2015. Courtesy of IMGiG (Diary of the Kurils 2015 Expedition, 7-9 August 2015, http://imgg.ru/ru/news/111 ). Activity during November 2015-April 2017. As a result of the direct observations of the recent eruption on the island, SVERT raised the Alert Level to Orange on 11 August 2015. There were no further reports available from SVERT until 17 November when gas-and-steam emissions were detected, and the Aviation Color Code was reported as Yellow. SVERT reported on 7 December 2015 that the ACC had been lowered to Green. Although SVERT did not report renewed activity from Chirinkotan until it issued a VONA on 29 November 2016 and raised the Alert Level to Yellow, the MIROVA thermal anomaly detection system indicated intermittent low-level anomalies between late May and early October 2016 (figure 7), indicating a heat source on the island. Figure 7. 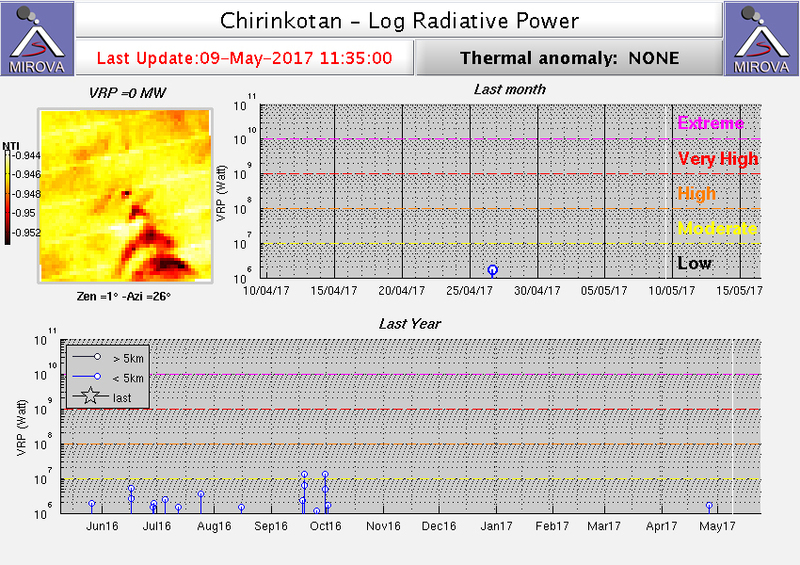 MIROVA data of Log Radiative Power at Chirinkotan for the year ending on 31 January 2017 showing a weak but persistent thermal anomaly between late May and early October 2016. Courtesy of MIROVA. The Tokyo VAAC issued a report of a volcanic ash plume from an eruption on 29 November (local time) 2016. The plume rose to 8.8 km altitude and drifted N. It was observed in satellite imagery for about 9 hours before dissipating. SVERT briefly raised the ACC to Yellow between 29 November and 2 December. They noted that the ash plume was observed drifting 39 km N. A new report of ash emissions came from the Tokyo VAAC on 26 January 2017, with an ash plume at 3.7 km drifting SE observed in the Himawari-8 satellite imagery. SVERT raised the alert level to Yellow on 27 January (UTM) 2017 and also noted ash emissions on 29 January drifting SE to a maximum distance of 105 km. They lowered the Alert Level to Green on 1 February 2017. A new ash plume was observed by the Tokyo VAAC on 1 March (local time) 2017 at an altitude of 5.5 km. When SVERT raised the Aviation Color Code to Yellow on 2 March, they noted that the plume had drifted 165 km E. They lowered the ACC back to Green on 6 March. The Tokyo VAAC reported a new ash plume at 6.1 km extending SE early on 21 March 2017. SVERT reported the emission at 15 km E of the volcano when they raised the ACC to Yellow a short while later. They noted on 24 March, when they lowered the ACC to Green, that the maximum extent of the ash cloud had been about 50 km SE. On 31 March 2017, the Tokyo VAAC issued an advisory for an ash plume at 6.7 km altitude drifting E, and SVERT raised the Alert Level to Yellow the next day. They reported the ash plume drifting 165 km NE before dissipating. Another plume on 7 April was observed by the Tokyo VAAC at 3.7 km altitude drifting SE. SVERT reported the plume at 5 km altitude drifting NE. SVERT lowered the ACC to Green on 24 April 2017. Reference: Neal C A, McGimsey R G, Dixon J, Melnikov D, 2005. 2004 volcanic activity in Alaska and Kamchatka: summary of events and response of the Alaska Volcano Observatory. U S Geol Surv, Open-File Rpt, 2005-1308: 1-67. Information Contacts: Sakhalin Volcanic Eruption Response Team (SVERT), Institute of Marine Geology and Geophysics, Far Eastern Branch, Russian Academy of Science, Nauki st., 1B, Yuzhno-Sakhalinsk, Russia, 693022 (URL: http://www.imgg.ru/en/, http://www.imgg.ru/ru/svert/reports); Tokyo Volcanic Ash Advisory Center (VAAC), 1-3-4 Otemachi, Chiyoda-ku, Tokyo, Japan (URL: http://ds.data.jma.go.jp/svd/vaac/data/); Institute of Marine Geology and Geophysics, Far Eastern Branch of the Russian Academy of Sciences, (FEB RAS IMGiG), 693 022 Russia, Yuzhno-Sakhalinsk, ul. Science 1B (URL: http://imgg.ru/ru); Hawai'i Institute of Geophysics and Planetology (HIGP), MODVOLC Thermal Alerts System, School of Ocean and Earth Science and Technology (SOEST), Univ. of Hawai'i, 2525 Correa Road, Honolulu, HI 96822, USA (URL: http://modis.higp.hawaii.edu/); MIROVA (Middle InfraRed Observation of Volcanic Activity), a collaborative project between the Universities of Turin and Florence (Italy) supported by the Centre for Volcanic Risk of the Italian Civil Protection Department (URL: http://www.mirovaweb.it/). SVERT noted that no further activity at Chirinkotan was visible after the ash emission on 21 March. The Aviation Color Code was lowered to Green (on a four-color scale). Based on satellite images, SVERT reported that on 21 March an ash plume from Chirinkotan rose to an altitude of 6 km (20,000 ft) a.s.l. and drifted 15 km E. The Aviation Color Code was raised to Yellow (the second lowest on a four-color scale). SVERT noted that no further activity at Chirinkotan was visible after the ash emission on 1 March. The Aviation Color Code was lowered to Green (on a four-color scale) on 5 March. On 6 February SVERT noted that the Aviation Color Code for Chirinkotan had been lowered to Green (lowest level on a four-color scale). Based on satellite images, SVERT reported that on 26 and 29 January ash plumes from Chirinkotan rose to an altitude of 3.5 km (11,500 ft) a.s.l. and drifted at most 105 km E and S. The Aviation Color Code remained at Yellow (on a four-color scale). SVERT reported that no additional activity at Chirinkotan was detected after the 29 November ash emission. The Aviation Color Code was lowered to Green (on a four-color scale) on 2 December. SVERT reported that on 29 November an ash plume rose from Chirinkotan was visible in satellite images rising to an altitude of 8.8 km (29,000 ft) a.s.l. and drifting 39 km N. The Aviation Color Code was raised to Yellow (on a four-color scale). On 7 December SVERT reported that the Aviation Color Code for Chirinkotan had been lowered to Green. 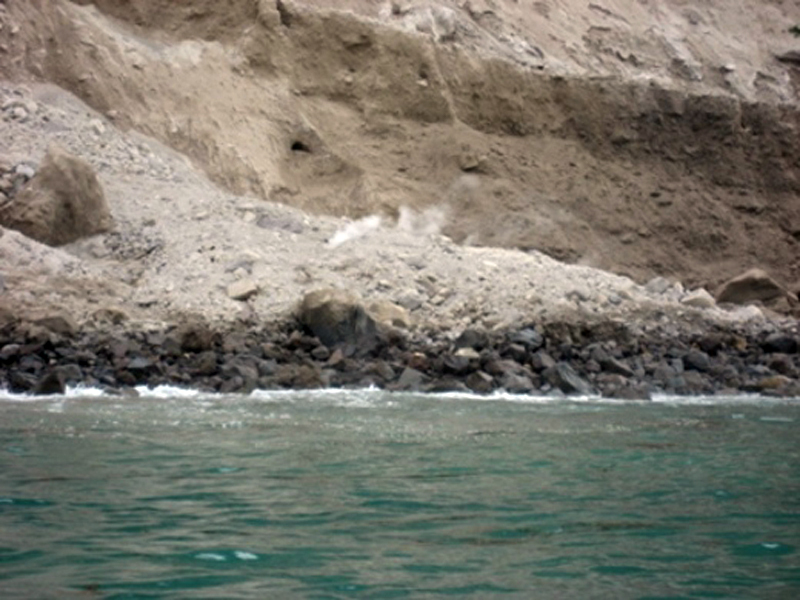 According to SVERT observers reported a weak eruption at Chirinkotan on 10 August, characterized by block flows and pyroclastic flows that reached the coast. The Aviation Color Code was raised to Orange. Based on satellite image observations, the Tokyo VAAC reported that a possible eruption at Chirinkotan on 21 July may have produced an ash plume that rose to an altitude of 3.7 km (12,000 ft) a.s.l. and drifted SE. A subsequent notice stated that ash was observed in images and then dissipated. SVERT reported that on 22 July a thermal anomaly over Chirinkotan was detected in satellite images as well as steam-and-gas emissions. The Aviation Color Code was raised to Yellow. SVERT reported that on 10 May a thermal anomaly over Chirinkotan was detected in satellite images. Cloud cover prevented views of the volcano on the other days during 4-11 May. The Aviation Color Code remained at Yellow. SVERT reported that during 17-18 April a thermal anomaly over Chirinkotan was detected in satellite images. Cloud cover prevented views of the volcano on the other days during 13-20 April. The Aviation Color Code remained at Yellow. SVERT reported that on 6 April a thermal anomaly over Chirinkotan was detected in satellite images. Weak gas-and-steam emissions were noted on 8 April. Cloud cover prevented views of the volcano on the other days during 7-13 April. The Aviation Color Code remained at Yellow. SVERT reported that on 5 April a thermal anomaly over Chirinkotan was detected in satellite images. Cloud cover prevented views of the volcano on the other days during 31 March-6 April. The Aviation Color Code remained at Yellow. SVERT reported that on 27 March a thermal anomaly over Chirinkotan was detected in satellite images. Cloud cover prevented views of the volcano on the other days during 23-30 March. The Aviation Color Code remained at Yellow. In a report from 4 March SVERT noted that weak steam-and-gas emissions from Chirinkotan were observed in January and February but that volcanic activity was not currently observed; the Aviation Color Code was lowered to Green. SVERT reported that weak steam-and-gas emissions from Chirinkotan were detected in satellite images on 6 and 8 February. Cloud cover obscured views on the other days during 2-9 February. The Aviation Color Code remained at Yellow. SVERT reported that weak steam-and-gas emissions from Chirinkotan were detected in satellite images on 31 January. Cloud cover obscured views on the other days during 26 January-2 February. The Aviation Color Code remained at Yellow. SVERT reported that weak steam-and-gas emissions from Chirinkotan were detected in satellite images during 13-14 January. A thermal anomaly was visible on 13 and 15 January. The Aviation Color Code remained at Yellow. SVERT reported that steam-and-gas emissions detected in satellite images rose 3 km above Chirinkotan and drifted SE on 5 January. A thermal anomaly was visible during 8 and 10-11 January. Cloud cover obscured views on the other days during 6-12 January. The Aviation Color Code remained at Yellow. SVERT reported that a thermal anomaly over Chirinkotan was detected in satellite images on 30 December. Cloud cover obscured views on the other days during 29 December-5 January. The Aviation Color Code remained at Yellow. SVERT reported that a thermal anomaly over Chirinkotan was detected in satellite images on 15 and 21 December. Cloud cover obscured views on the other days during 16-22 December. The Aviation Color Code remained at Yellow. SVERT reported that a thermal anomaly over Chirinkotan was detecetd in satellite images during 10-11 and 13-14 December. Cloud cover obscured views on the other days during 8-15 December. The Aviation Color Code remained at Yellow. 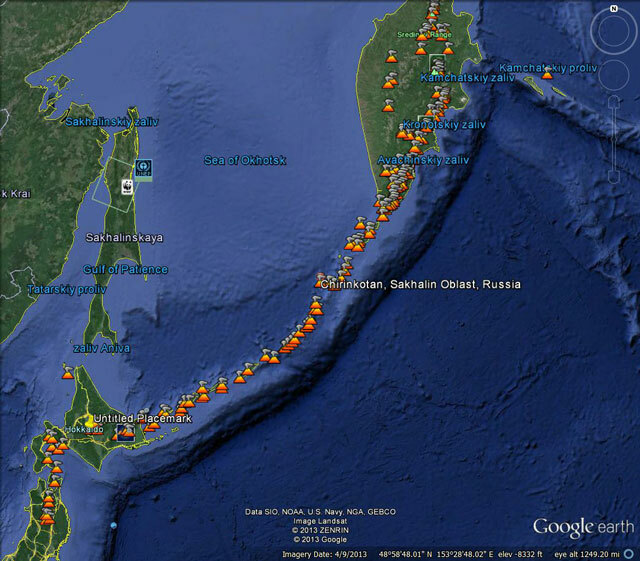 SVERT reported that satellite images of Chirinkotan showed gas-and-steam emissions on 7 May. Cloud cover obscured views on the other days during 5-12 May. The Aviation Color Code remained at Yellow. SVERT reported that satellite images of Chirinkotan showed gas-and-steam emissions on 25 and 27 April. Cloud cover obscured views during 21-28 April. The Aviation Color Code remained at Yellow. SVERT reported that satellite images of Chirinkotan showed a thermal anomaly on 14, 15, and 17 April, and gas-and-steam emissions on 20 April. Cloud cover obscured views during 16, 18-19, and 21 April. The Aviation Color Code remained at Yellow. SVERT reported that satellite images of Chirinkotan showed gas-and-steam emissions on 9 April drifting more than 50 km SE. Cloud cover obscured views during 10-15 April. The Aviation Color Code remained at Yellow. SVERT reported that satellite images of Chirinkotan showed diffuse gas-and-steam emissions on 24 March and steam-and-gas plumes drifting 80-170 km SE during 26-27 March. Cloud cover obscured views on the other days during 25-31 March. The Aviation Color Code remained at Yellow. SVERT reported that a steam-and-gas plume from Chirinkotan was observed in satellite images drifting more than 80 km SE on 20 March. Diffuse steam-and-gas emissions were observed during 21-22 March. Cloud cover obscured views on the other days during 17-19 and 23-24 March. The Aviation Color Code remained at Yellow. SVERT reported that a thermal anomaly over Chirinkotan was observed in satellite images on 4 March. Cloud cover obscured views during 5-10 March. The Aviation Color Code remained at Yellow. SVERT reported that a thermal anomaly over Chirinkotan was observed in satellite images on 25 February and gas-and-steam emissions were observed on 27 February. Cloud cover obscured views on other days during 24 February-3 March. The Aviation Color Code remained at Yellow. SVERT reported that a thermal anomaly over Chirinkotan was observed in satellite images on 20 February. Cloud cover obscured views on other days during 17-24 February. The Aviation Color Code remained at Yellow. SVERT reported that a thermal anomaly over Chirinkotan was observed in satellite images on 12 and 15 February, and steam-and-gas emissions were observed on 16 February. Cloud cover obscured views on other days during 11-17 February. The Aviation Color Code remained at Yellow. SVERT reported that a thermal anomaly over Chirinkotan was observed in satellite images on 8 February, and steam-and-gas emissions were observed on 9 February. Cloud cover obscured views on other days during 4-10 February. The Aviation Color Code remained at Yellow. SVERT reported that a thermal anomaly over Chirinkotan was observed in satellite images on 21 January. Cloud cover obscured views during 22-27 January. The Aviation Color Code remained at Yellow. SVERT reported that a thermal anomaly over Chirinkotan was observed in satellite images on 15 and 17 January. Gas-and-steam emissions were also observed on 17 January. Cloud cover obscured views on the other days during 14-20 January. The Aviation Color Code remained at Yellow. SVERT reported that a thermal anomaly over Chirinkotan was observed in satellite images on 9 and 12 January. Cloud cover obscured views on the other days during 7-13 January. The Aviation Color Code remained at Yellow. SVERT reported that a thermal anomaly over Chirinkotan was observed in satellite images during 25-26 December. Cloud cover obscured views on the other days during 23-30 December. The Aviation Color Code remained at Yellow. SVERT reported that a thermal anomaly over Chirinkotan was observed in satellite images on 9, 12, and 15 December. Cloud cover obscured views on the other days during 10-16 December. The Aviation Color Code remained at Yellow. SVERT reported that a weak thermal anomaly over Chirinkotan was observed in satellite images during 2-4 December. The Aviation Color Code remained at Yellow. SVERT reported that steam-and-gas emissions from Chirinkotan drifted more than 50 km on 25 November. The Aviation Color Code remained at Yellow. SVERT reported that on 22 November a thermal anomaly over Chirinkotan was observed. The Aviation Color Code remained at Yellow. SVERT reported that during 13-15 November a thermal anomaly over Chirinkotan was observed, as well as steam-and-gas emissions during 14-15 November. The Aviation Color Code remained at Yellow. SVERT reported that during 4-6 November a thermal anomaly over Chirinkotan was observed. Steam-and-gas emissions during 5-6 November drifted 55-100 km SE. The Aviation Color Code remained at Yellow. SVERT reported that during 29-31 October, steam-and-gas emissions from Chirinkotan were detected in satellite images; thermal anomalies were also detected during this time. The Aviation Color Code remained at Yellow. SVERT reported that a thermal anomaly from Chirinkotan was detected in satellite images on 1 September. The Aviation Color Code remained at Yellow. Based on analysis of satellite images, SVERT reported that a possible thermal anomaly from Chirinkotan was observed on 12 August. The Aviation Color Code remained at Yellow. Based on analysis of satellite images, SVERT reported that a thermal anomaly and gas-and-steam emissions from Chirinkotan were observed on 5 and 9 August. A thermal anomaly was visible on 7 August, and possible gas-and-steam emissions were observed on 7 and 8 August. The Aviation Color Code remained at Yellow. Based on analysis of satellite images, SVERT reported that a thermal anomaly from Chirinkotan was observed during 29-31 July. The Aviation Color Code remained at Yellow. Based on analysis of satellite images, SVERT reported that a thermal anomaly from Chirinkotan was observed on 22 July. Weak steam-and-gas emissions and a weak thermal anomaly were observed on 25 July. The Aviation Color Code remained at Yellow. Based on analysis of satellite images, SVERT reported that a thermal anomaly and possible weak steam-and-gas emissions from Chirinkotan were observed on 16 and 18 July. The Aviation Color Code remained at Yellow. Based on analysis of satellite images, SVERT reported that weak steam-and-gas emissions from Chirinkotan were observed on 12 July and a thermal anomaly was detected during 12-13 July. The Aviation Color Code remained at Yellow. Based on analysis of satellite images, SVERT reported that steam-and-gas emissions from Chirinkotan were observed on 3 July and a thermal anomaly was detected on 4 July. The Aviation Color Code remained at Yellow. Based on analysis of satellite images, SVERT reported that steam-and-gas emissions from Chirinkotan were detected on 25 and 26 June. The Aviation Color Code remained at Yellow. Based on analysis of satellite images, SVERT reported that a weak thermal anomaly over Chirinkotan was detected on 21 June. A thermal anomaly and steam-and-gas emissions were detected on 23 June. Based on analysis of satellite images, SVERT reported that dense steam-and-gas emissions, possibly containing ash, rose from Chirinkotan on 11 June. A thermal anomaly was detected on 13 June, and diffuse steam-and-gas emissions were observed on 16 June. SVERT reported that steam and gas activity at Chirinkotan was observed in satellite imagery during 24-25 May. 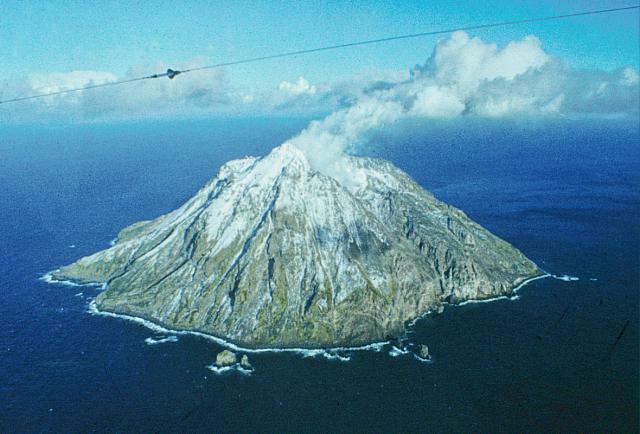 In April 1979, an eruption began from Chirinkotan volcano, which forms an isolated, uninhabited island about 3 km in diameter. Block lava flowed down the SSW flank in April and May. Ash explosions occurred regularly during the summer of 1979 and explosive activity increased in October. In January and April 1980, moderate explosions occurred 1-2 times per hour. Chirinkotan was observed from the air 11, 12, and 31 October, and 2 November. A thick gas and ash column reached 700-800 m above the crater, and drifted 6-8 km downwind on 11 October. Intense gas emission occurred throughout the crater. On 12 October gas emission was less intense but a gas cloud reached 400-600 km high and was 3-4 km long despite a strong wind. By 31 October fumarolic activity had diminished significantly. On the E crater slope a few groups of large fumaroles were observed. A gas plume 200 m in diameter was 250 m high and 800-900 m long. Flank ashfall had been covered by snow that fell 12-13 October. Activity was similar on 2 November. In 1979-1980, an eruption at Chirinkotan included a series of ash explosions and a lava flow (SEAN 05:06). In October and November 1986, airborne observers saw a column of thick gas and ash, and then fumarolic activity (SEAN 12:04). This report discusses events during 2013 through April 2014. The location of Chirinkotan in the Kuril Islands is shown in figure 1. Figure 1. Map showing location of Chirinkotan. Courtesy of Google Earth. According to the Sakhalin Volcanic Eruption Response Team (SVERT), gas-and-steam emissions occurred frequently in 2013-2014 (table 1). The Aviation Color Code was Green on 24-25 May 2013, when emissions were first reported, but raised to Yellow during early June 2013, where it has remained through April 2014, the end of this report. The volcano was often obscured by clouds. According to the U.S. Geological Survey, an M 8.3 earthquake occurred on 24 May 2013 beneath the Sea of Okhotsk, at a point is 656 km N of the volcano. The focal depth of the earthquake was ~ 600 km. 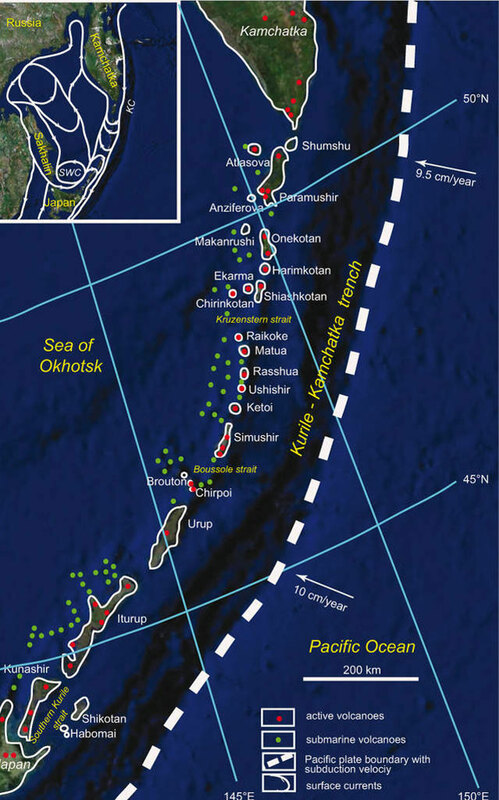 The first reported gas-and-steam emission from Chirinkotan, which is in the Sea of Okhotsk, was on 24-25 May, suggesting a possible link between the two events. Table 1. SVERT-reported dates on which gas-and-steam emissions were observed from 24 May 2013 through 30 April 2014, based on analysis of satellite images. Thermal alerts detected by SVERT and the MODVOLC satellite thermal alert system are also noted. Information Contacts: Sakhalin Volcanic Eruption Response Team (SVERT) (URL in English: http://www.imgg.ru/?id_d=659); Hawai'i Institute of Geophysics and Planetology (HIGP), MODVOLC Thermal Alerts System, School of Ocean and Earth Science and Technology (SOEST), Univ. of Hawai'i, 2525 Correa Road, Honolulu, HI 96822, USA (URL: http://modis.higp.hawaii.edu/); and Earthquake Hazards Program, US Geological Survey (URL: http://earthquake.usgs.gov/). This Bulletin report discusses activity at Chirinkotan from May 2014 to late-April 2015. The information presented here was primarily sourced from the Sakhalin Volcanic Eruptions Response Team (SVERT). SVERT is in charge of monitoring volcanic activity within the Kuril Islands from Onekotan in the N to Kunashir in the S (figure 2). The volcano also forms an island of the same name. Figure 1 in BGVN 38:12 provides a view of Chirinkotan's location within the Kuril Islands. Our last Bulletin report (BGVN 38:12) recorded Chirinkotan activity that occurred from May 2013 to April 2014. During that interval, gas-and-steam emissions and thermal alerts were frequently observed and reported (table 1 in BGVN 38:12). Figure 2. Maps highlighting the location of Chirinkotan, within the Kuril Islands. On the larger map, Chirinkotan is represented by a red dot directly above the label "Chirinkotan." The map also shows the other islands of the Kuril archipelago, which are located between the Kamchatka Peninsula (Russia, top center) and Hokkaido (Japan, lower left). Also marked on this map are appoximate seafloor convergence rates (arrows) and the location of the trench's E margin (heavy dashed line). The index map, in the top left corner, shows the general area in which the Kuril Islands are located. 'KC' represents the Kamchatka Current and 'SWC' represents the Soya warm current. Image taken from Belousov and others (2009). May 2014 to late-April 2015. Due to similarities between Chirinkotan's activity from May 2014 through late-April 2015 and May 2013-April 2014 (BGVN 38:12), we once again use a table to summarize Chirinkotan's activity. Due to their inaccessibility, SVERT relies on satellite monitoring to monitor volcanic activity within the Kuril Islands. On the basis of those observations, SVERT often reported thermal anomalies and gas-and-steam emissions at Chirinkotan during this reporting interval (May 2014 to late April 2015). SVERT frequently reported that clouds obscured views of Chirinkotan, which halted collection of satellite data. SVERT also reports Chirinkotan's Aviation Color Code (ACC). The ACC is a four color scale used by some volcano observatories and the aviation community to communicate volcanic-ash hazards of a volcano. The colors in order of increasing volcanic activity are Green, Yellow, Orange and Red. In an overview, the ACC stood at Yellow during the following periods: May 2014 to the beginning of June 2014; late November 2014 to late February 2015; and from mid-March to late April 2015. SVERT reported Chirinkotan's ACC as Green during June to late November 2014 and early March 2015. Table 2 summarizes available SVERT data on Chirinkotan's activity. The table is divided into two columns labeled Date and Comments. The Date column refers to the week during which Chirinkotan activity was observed or reported by SVERT. The Comments column details Chirinkotan's ACC and what activity occurred at Chirinkotan on a particular day or during a particular week. Table 2. Table condensing Chirinkotan's activity and cases where cloud cover hindered observations between May 2014 and late April 2015. The information in the table was observed in satellite data by SVERT personnel. Bulletin editors gathered this information from available SVERT material (generally published on the end date of the date ranges in the left column). References. Belousov, A., Belousova, M., and Miller, T., 2009, Kurile Islands, pp 520-525 in: Encyclopedia of Islands, Gillespie, R. and Clague D., eds., University of California Press, 1111 pp., accessed on 29 April 2015, (URL: http://www.kscnet.ru/ivs/lavdi/staff/belousov/kuriles-2009.pdf). Information Contacts: Sakhalin Volcanic Eruptions Response Team (SVERT), Institute of Marine Geology and Geophysics (IMG&G) Far East Division Russian Academy of Sciences (FED RAS), 1B Science St., Yuzhno-Sakhalinsk, 693022, Russia (URL: http://www.imgg.ru/). The small, mostly unvegetated 3-km-wide island of Chirinkotan occupies the far end of an E-W volcanic chain that extends nearly 50 km W of the central part of the main Kuril Islands arc. It is the emergent summit of a volcano that rises 3000 m from the floor of the Kuril Basin. A small 1-km-wide caldera about 300-400 m deep is open to the SW. Lava flows from a cone within the breached crater reached the shore of the island. Historical eruptions have been recorded since the 18th century. Lava flows were observed by the English fur trader Captain Snow in the 1880s. Neal C A, McGimsey R G, Dixon J, Melnikov D, 2005. 2004 volcanic activity in Alaska and Kamchatka: summary of events and response of the Alaska Volcano Observatory. U S Geol Surv, Open-File Rpt, 2005-1308: 1-67. There is no Deformation History data available for Chirinkotan. There is no Emissions History data available for Chirinkotan. The small, mostly unvegetated 3-km-wide island of Chirinkotan is the emergent summit of a volcano that rises 3000 m from the floor of the Kuril Basin. Submarine terraces are lacking around the island, suggesting the edifice is of Holocene age. Chirinkotan lies at the far end of an E-W-trending volcanic chain that extends nearly 50 km west of the central part of the main Kuril Islands arc. Historical eruptions have been recorded at Chirinkotan since the 18th century, including one observed by the English fur trader Captain Snow. Photo by R. Bulgakov, 1990 (Institute of Marine Geology and Geophysics, Yuzhno-Sakhalin). There are no samples for Chirinkotan in the Smithsonian's NMNH Department of Mineral Sciences Rock and Ore collection. Large Eruptions of Chirinkotan Information about large Quaternary eruptions (VEI >= 4) is cataloged in the Large Magnitude Explosive Volcanic Eruptions (LaMEVE) database of the Volcano Global Risk Identification and Analysis Project (VOGRIPA).